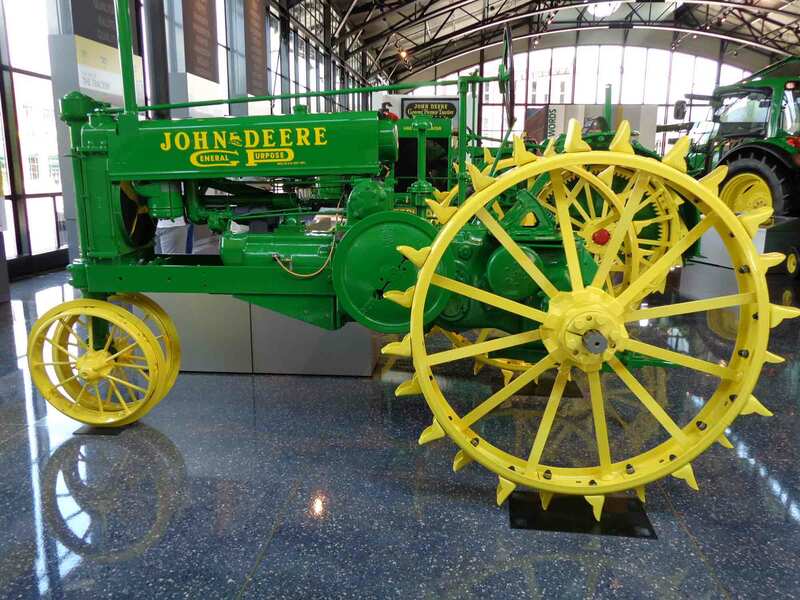 The term “tractor” was first recorded in 1896—just four years after an Iowa blacksmith named John Froelich created what would become the prototypical farming tractor. It evolved from an earlier piece of equipment called a traction engine (1859). The meaning of both tractor and traction is anchored in the Latin trahere, which means “to pull, to draw”—which, while not the limit of what tractors do, is certainly their prime purpose. Tractors revolutionized farming—though size and cost initially kept them from being rapidly adopted. However, as more and more companies made tractors, prices came down, and horses (which had replaced oxen by 1900) slowly began to be replaced themselves. The early 1900s saw a lot of experimentation and development. This 1930s John Deere tractor is a good example of those developments. 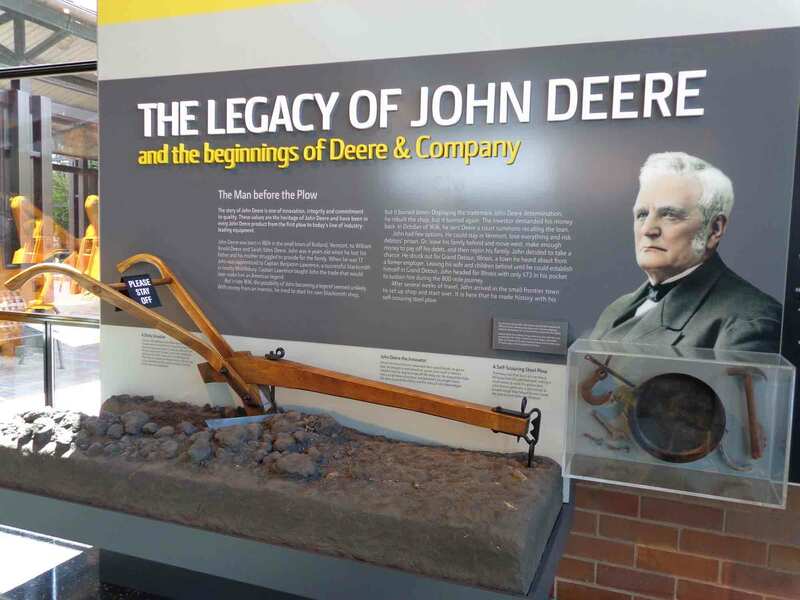 Here is a reproduction of that 1837 John Deere plow, displayed at the John Deere Pavilion in Moline. It’s interesting to note that the hoe was so ideally suited to farming that worldwide and throughout history, it has been created and used by those who were trying to grow stuff. In museums and at living history venues, I’ve seen early Native American hoes made with large seashells or deer antlers attached to the end of long poles. Throughout Asia, I’ve seen hoes, both in current use and in museums, that are nearly identical to those used today in modern gardens. So some things don’t change, or change very little, despite other advances—they don’t need to change, because they were right from the start. 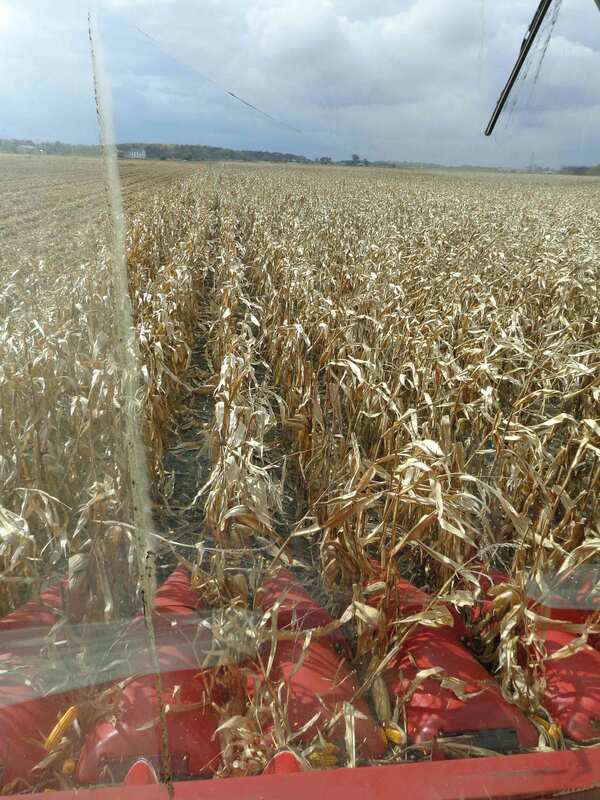 Still, and especially in light of the dramatic evolution of farming technology of the last 100 years, it is remarkable how little in farming changed from about 8000BC to the early 1800s. 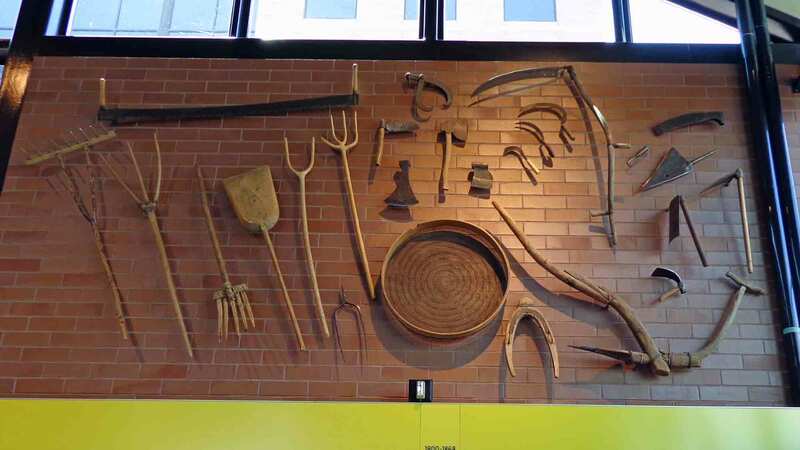 The tools pictured below, on display at the John Deere Pavilion, were what farmers had to work with in the early 1800s. From central Illinois, I headed northeast to Moline, headquarters of the John Deere Company. It’s impossible to talk about farming in the Midwest without talking about John Deere, man and company, so of course I had to visit. 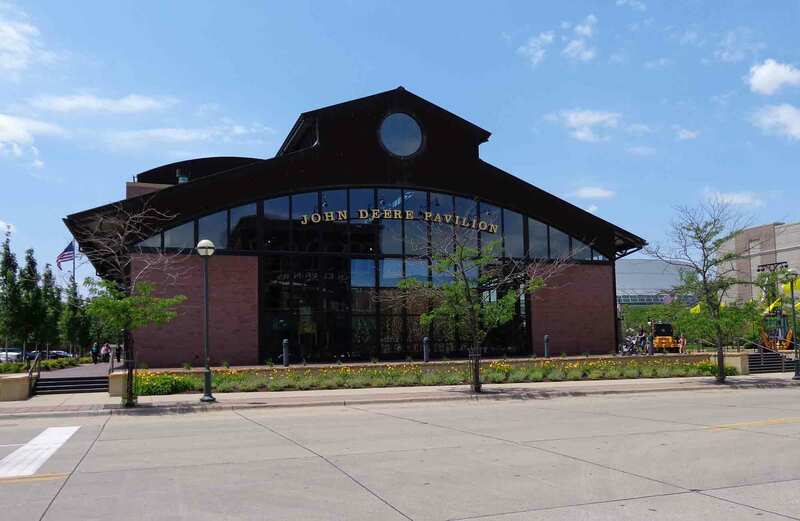 In addition to John Deere corporate headquarters, Moline offers the John Deere Pavilion, where one can witness the history of the tools and machines that transformed farming in the Heartland and around the world. Many of those who are docents at the pavilion are former John Deere employees, so they know the equipment extremely well. It makes for a great day. 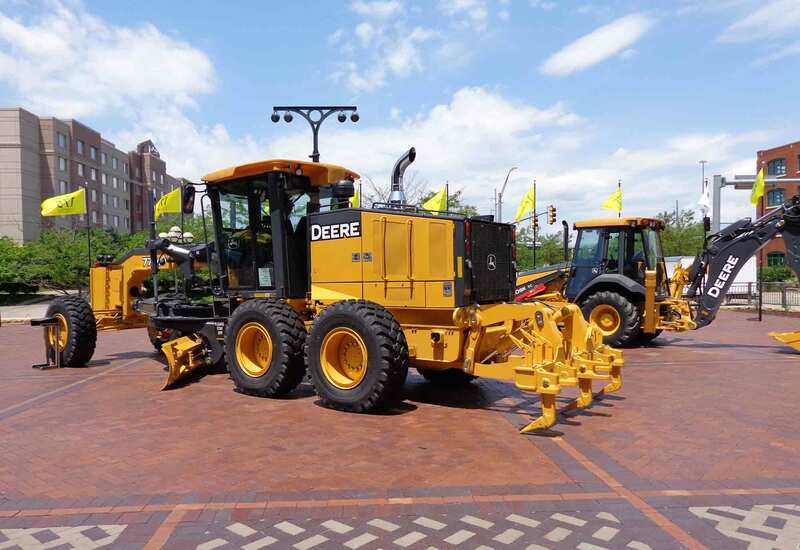 But John Deere creates more than just farm equipment these days, and it was the big earthmovers that were parked outside the pavilion. (It was, in fact, from the farm equipment industry that earthmoving equipment emerged.) Some of the non-farm equipment inside is worth noting, as well. 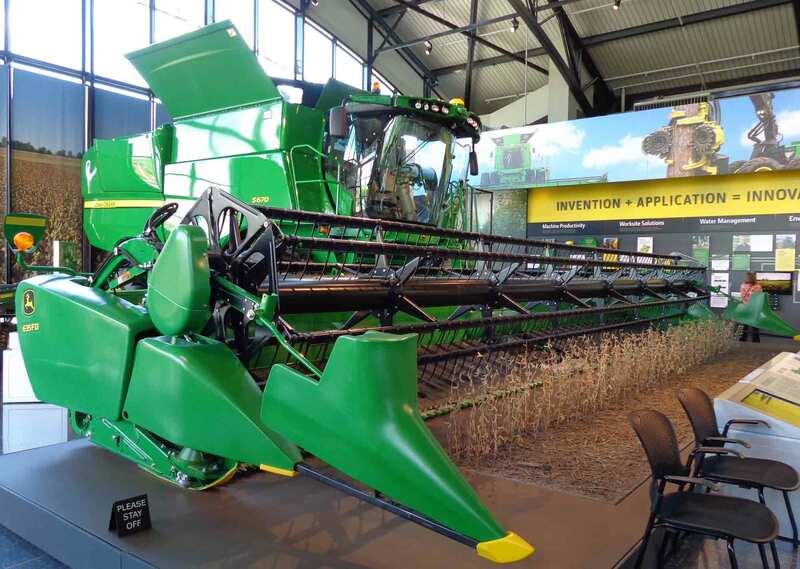 I definitely recommend visiting, if you want to see some remarkable machines: John Deere Pavilion.